What to do if you’ve found a stray? By law, the first step should always be to notify local Animal Control, even if you plan to keep the dog while searching for its owner. You only have 3 business days to notify or surrender a dog to Animal Control, after which they cannot accept it (it will become your responsibility, but not legally your property. Animal Control is the first place an owner will/should look for a lost pet. If you choose to keep the dog while looking for the owner, you must actively look for the true owner for 30 days before you can claim it as yours, sell it or give it away. Sadly, animals are considered “property”, and there are the same legal requirements as any found property. (Animal Control Agencies can rehome the animal after only 72 hours, as per their agreement with the State – which is why it’s so important for owners to visit the shelters in person every day when looking for their lost pet – but for private parties, it is 30 days). Take the dog to any animal shelter or veterinarian (and some police departments) to have it scanned for a microchip. This is a free service. In addition to posting on local community forums and lost/found pet sites, place a “Found” ad on Craigslist in the Lost & Found section (Kennewick-Pasco-Richland, as well as Yakima… many dogs are stolen and moved elsewhere). Most newspapers will also run a lost & found ad in the classifieds for free. 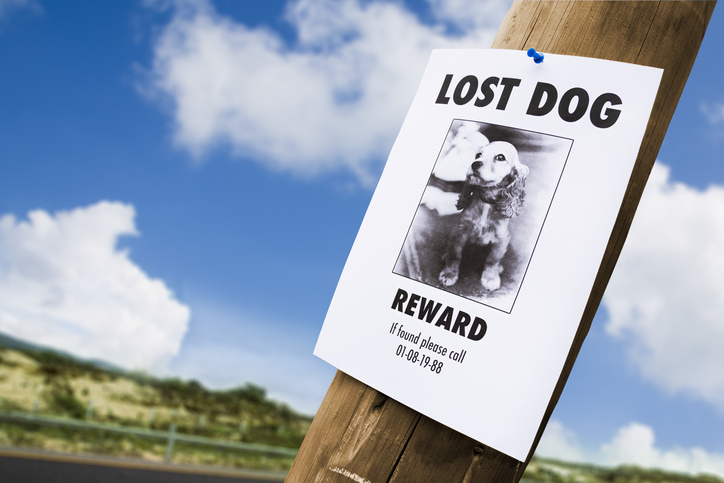 If possible, put up posters in the area the dog was found, and utilize local bulletin boards – all veterinarians have a lost & found board, too. Many people are not on Facebook, or even the internet. Require proof of ownership… vet records, adoption papers, photos, an accurate description, etc. (remove any collar before taking photos to post – the owner will be able to describe it. Be sure to put it back on! When taking photos, don’t show the tail, or the gender… photograph just one side or angle. The owner will be able to identify any specific characteristics, but a friend or neighbor might recognize the dog and alert the owner that it’s even missing. DO give a general description, even if you don’t take photos. Simply posting “Found dog, message to describe” is far too vague, and not fair to the dog). Do not offer animals to strangers for free. Too many end up as bait in fighting, or used as breeders, or resold for profit to just anyone who may or may not be capable or willing to provide a safe, responsible home. If you must rehome a found animal, check with the local rescues. Thank you all for keeping animals safe in our community! *If the animal is aggressive, injured or in immediate danger, call local police, or Non Emergency Dispatch: Benton County (509) 628-0333. Franklin County (509) 545-3510.